If a Standard Bull Terrier seems like a bit much for you to handle, why not give the Mini Bull Terrier a try? The Bull Terrier breed was basically established by breeding the more cumbersome English Bulldog with the English Terrier. This resulted in the slightly more streamlined breed known today. The larger variety was bred down to create a Miniature Bull Terrier that would be easier to manage as a pet. In essence, standard and Mini Bulls have everything in common except their size. The Standard variety can reach up to 24 inches tall, and an average weight of about 60 pounds, with some specimens weighing even more. Although the Mini Bull is still a substantial dog, it generally tops out at 14 inches tall, and weighs roughly half as much as its larger relative. Size issues aside, Mini Bulls are compact and muscular, with unusual heads that are somewhat egg-shaped. In addition, these dogs have slit-shaped eyes that make them look even more unique amongst other dog breeds. The ears on these dogs should be held completely erect, and the entire head is set upon a strong neck that is nearly indiscernible from the broad shoulders and deep chest that follow. These dogs have muscular bodies that are slightly longer than they are tall, making them rectangular in appearance. The tail is moderately long and usually held outward from the rear. Luckily, their Spartan coats are quite easy to manage. One or two baths a month will keep a Mini Bull in good shape, but you can just as easily substitute pet wipes for a full bath most of the time. Shedding occurs in the spring and fall. While a weekly brushing suffices most of the time, you might prefer to remove loose hairs with a grooming glove during heavy shedding periods. A Mini Bull Terrier can make a fine family pet if you are able to establish and maintain dominance right from the start. These dogs are strong and can be quite stubborn as well, which can be a bad combination without proper training. If given a choice between following your directions or choosing his own course of action, a Bully will take the lead every time. It is up to you to keep this behavior in check. It cannot be overstated that these dogs need a good deal of socialization as well as obedience training to make them the best companions they can possibly be. You will be well rewarded for your efforts with a loving and strongly devoted companion that also makes an excellent watchdog against intruders. When aroused, the Mini Bull is every bit as intimidating as the Standard Bull Terrier. Sadly, these dogs don't usually get along well with other pets, and they can be quite aggressive and territorial. For these reasons, they are generally best kept in single pet homes. However, they do require a good deal of companionship from their humans, and could resort to destructive behavior when bored or frustrated. Bullies like to be in on the action, so try to include your pet in family activities whenever possible. A well cared for specimen can be expected to live up to 12 years old. However, there are a few prevalent health problems with this breed. Deafness: This malady is more prevalent in white dogs than colored specimens. Slipping knee caps: This might be attributed to the breed's propensity toward obesity. 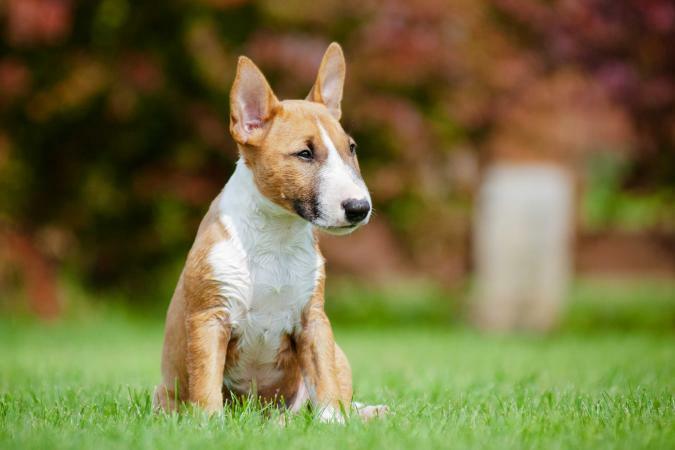 Like many strong breeds, the Mini Bull Terrier is not the ideal pet for every home, and although the smaller size does make these dogs slightly more manageable, they can still be a handful. It takes a strong and attentive owner to handle these dogs and encourage the best they have to offer.